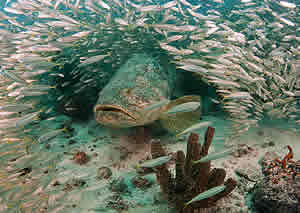 Atlantic goalith grouper. credit Walt Sterns. GAINSVILLE, Florida -- In the waters along Florida's east and west coasts, Florida State University marine biologists are collecting new data on the once severely overfished Atlantic goliath grouper, a native species that is making a comeback in the southeastern United States after a 21-year moratorium on its capture while remaining critically endangered everywhere else in the world. The three-year study will determine what specific conditions and fishy behaviors are supporting the goliath grouper's population recovery in the Atlantic Ocean and Gulf of Mexico around the Sunshine State. Findings from the research could help to answer several high-stakes questions: Is there a sustainable fishing level for this species? Or are there better economic uses of this marine resource? The answers will be crucial to the Gulf of Mexico Fishery Management Council and the South Atlantic Fishery Management Council. They set policy on the management and conservation of the slow-moving, inquisitive giants, some of which grow to lengths of 9 feet and weights of 400 to 800 pounds. Meanwhile, the new study will be unique in two key ways. "First, while in the past scientists had to sacrifice the fish to gather age, reproductive and predatory information, at FSU we've developed a non-destructive means of obtaining the data that spares its life," said Florida State University Coastal and Marine Laboratory scientist Christopher C. Koenig, who will lead the project with colleagues at the University of South Florida and the University of Florida. "Second, those new, non-lethal data-gathering methods allow us to actively engage commercial and recreational fishermen in the scientific process," Koenig said. "We will train the fisherman to obtain scientific samples, and to tag and release the fish." Among other revealing things, those samples will help Koenig and his colleagues assess the ages of individual Atlantic goliath grouper, which can live for up to 50 years. Learning the average age of the fish in the region should make clearer just how reproductively successful the species has been in the aftermath of the extreme overfishing that occurred in Florida coastal areas during the 1980s �� which triggered the fishing moratorium on goliath grouper that has been in effect since 1990. The scientists also will investigate predatory behaviors and migration patterns that could be contributing to population recovery. What they learn may guide future conservation and fishery management decisions on a wide range of specific issues. "For example," said Koenig, "a recreational catch-and-release enterprise, the scope and impact of which are currently unknown, has developed despite the moratorium on goliath grouper harvest. There also is considerable recreational interest in harvesting for science and in allowing restricted recreational harvest on a regular basis. "Another relatively unstudied group with an economic stake in this species is the diving community," he said. "Interest in underwater viewing of unexploited marine populations, especially including large animals such as goliath grouper, is on the rise." With competing interests to either reopen the goliath grouper fishery at some level or declare the species endangered, Koenig said "the management arena has become politically charged and begs for better scientific knowledge." Koenig and marine ecologist Felicia Coleman, director of the FSU Coastal and Marine Laboratory, have studied goliath grouper life history and behavior for nearly 18 years and published a number of papers on the species' biology, ecology and population dynamics. Their findings have demonstrated the importance of protecting mangrove habitat because of its critical value as nursery habitat for juvenile goliath grouper, whose nearshore survival rate affects the abundance of adults in the offshore environment. Koenig and Coleman have worked closely with commercial and recreational fishermen in many aspects of their research. "While we'd like to be optimistic about their recovery, the reality is that goliath grouper are exceptionally vulnerable to fishing pressure," Coleman said. "They also are vulnerable to habitat loss, which in the South Florida ecosystem has been altered to such a high degree over the last 100 years that suitable mangrove nursery habitat in all probability presents a serious bottleneck to production of this species. Koenig points to a misperception that the goliath grouper is an invasive, nuisance species �- though the fish is a native that evolved for millions of years on Florida and Caribbean reefs. "Fisherman may perceive that all other species they target, such as snapper, now are at an all-time low, and since the protected goliath grouper is on its way to recovery, they may assume the goliath grouper is to blame for the decline in the other species," Koenig said. "But many of those other target species are themselves heavily overfished and still undergoing overfishing, and current data show that goliath groupers eat mostly crabs and slow-moving spiny fish and have a positive effect on the ecosystem because of the type of habitat they create by digging." "Clearly we must do a better job as scientists and fishery managers to educate the public about marine systems," Coleman said. Funding for the current Atlantic goliath grouper study comes from a $481,664 grant awarded to Koenig and Coleman by the National Oceanic and Atmospheric Administration Marine Fisheries Initiative. The research team also includes USF Assistant Professor Christopher Stallings and UF Associate Professor Debra Murie.